The Income Tax department has released new Income Tax Return Forms ITR-1(also known as Sahaj), ITR-2, 3, 4S, 5, 6, 7 for AY 2019-20. ITR Forms are Income Tax Return Forms that are defined by CBDT (Central Board of Direct Taxes), Department of Revenue, Ministry of Finance, Government of India has defined 7 types of Income Tax Return Forms that are applicable according to the status of Taxpayer, type of Income, and amount of Income. Income Tax Department seems to have focused on increasing Tax Net, reducing Tax Evasion, and inter-connect Indirect Taxes with Direct Taxes, which was introduced last assessment year but quickly withdrawn due to GST not being fully aligned with Financial Year. For individuals being a resident (other than not ordinarily resident) having total income up to Rs. 50 Lakh, having Income from Salaries, one house property, other sources (Interest etc. ), and agricultural income up to Rs.5,000. Major Changes for AY 2019-20: No major changes except that the those who are directors or have invested in unlisted companies are excluded to use this Form. 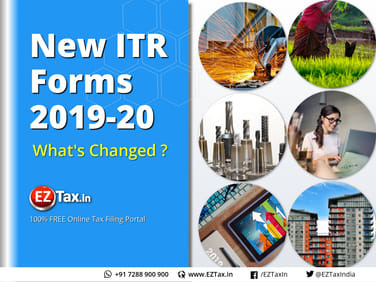 Major Changes for AY 2019-20: While Agriculture income is exempted from Income Tax, with the new forms, Tax payers having agricultural income, who are using ITR-2 Form will have to provide additional details, including land measurement in acres, name of the district along with Pin code in which the land is located, whether it is owned or held on lease, and the quality of land mentioning whether the land is irrigated or rain-fed etc. In addition, income received from the residential properties would have to furnish details such as Tenant Name, PAN or TAN Number. Major Changes for AY 2019-20: For those having business or profession with GST registration are now needed to furnish GST Revenue, GSTIN (GST Number). This disclosure is extended to ITR Forms from 3-6. Major Changes for AY 2019-20: It's same as last year except that the assessee is neither a director nor have invested in any unlisted company. Major Changes for AY 2019-20: New questionnaires were added for Startups to provide additional information such as recognition by the Department for Promotion of Industry and Internal Trade (DPIIT), list of investors, the issue price of shares, and funds received from the external parties. Unlisted companies filing ITR-6 now need to provide details of all investors, their residential status in India, PAN, date of allotment, number of shares held, issue price per share, and total amount invested. In addition to above changes, tax payers with foreign assets are mandated to disclose details of foreign accounts, foreign equity, debt, and foreign cash value insurance or annuity contracts, along with details of overseas bank accounts. While this was the same, but an additional emphasis was made to disclose such. While no major changes on the due dates, below are the dates to remember. July 31st - for all persons, entities that are not required to be audited. September 30th - for all persons, entities that are required to be audited. Penalties (234A, B, C, F) already applicable from last year are applicable after the above due dates. to bring higher compliance particularly on Businesses, Firms, Companies, while laying foundation to track assets both In-land (agriculture), on Foreign Soil (Foreign Assets both Soft & Hard).